It’s disheartening when students don’t leave their creative comfort zones. When brainstorming solutions to problems, we want your students to explore a huge range of ideas so they can identify the most innovative, and disruptive, business models possible. In this post we’ll share two exercises that will push students beyond their comfort zone to generate solutions that hold tremendous potential for solving customer problems. The first is less structured. The second is more structured. Using the lesson plan from our Idea Generation article, students generate a quick list of problem ideas with the Problem List and Observation techniques described. Now ask them to review their list of ideas and choose the problem they are most excited about solving. This should be a problem that resonates with them. 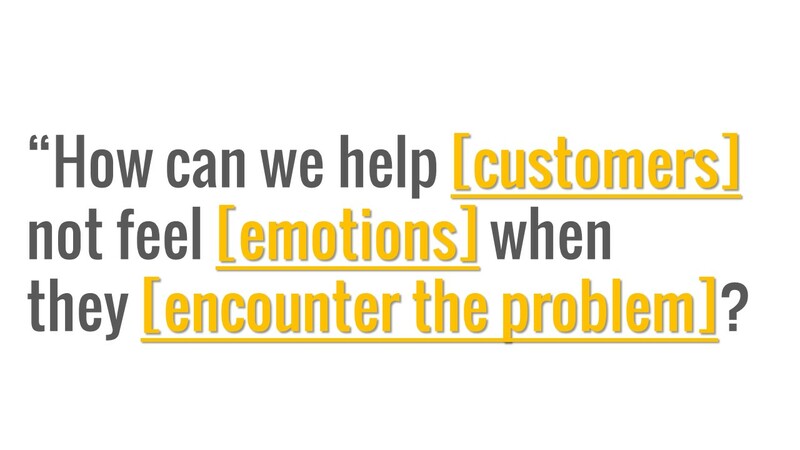 Does serving the customer who experiences that problem excite them? Does envisioning a solution make them smile? Once they’ve choose the problem they’re most motivated to solve, your students should list 100 solutions to that problem (thank you to the amazing Tina Seelig for the 100-solutions-approach-to-brainstorming from her Crash Course in Creativity!). Encourage your students to keep going, even when they think they are done, to come up with more interesting and surprising solutions. They should consider the worst ideas they can think of, the most expensive and least expensive solutions, as well as ideas that would have worked 100 years ago or 100 years in the future. Push them to suspend their judgement and find 100 solutions. 100 solutions seems unrealistic because students generally want to stay in their comfort zone. In terms of ideas, that means they want to stick with the safety of top-of-mind solutions that anyone could identify. You want your students to shed these easy solutions and dig deep to create more innovative solutions. You want them to sweat a bit, to push beyond their comfort zone, to be a bit scared thinking about the types of solutions they envision. Most entrepreneurship students quickly formulate ideas around either shallow or impossible solutions. They ignore the problem customers experience, they ignore the feelings that problem stirs up in customers, and they look for something shiny. Completing this exercise will help students feel safe exploring their creative potential, pushing past their comfort zone. Exercise 2 is adapted from The FOCUS Framework, a workbook series that provides entrepreneurs an action-oriented approach to achieving product-market fit (and is authored by, Justin Wilcox, one of the contributors to this blog). This brainstorming exercise provides a bit more structure to help students break out of their comfort zone. As with Exercise 1, the outcome is a large quantity of ideas that are not top-of-mind. This exercise has an additional purpose – to break the patterns and restrictions that hold people back from truly innovative thinking. 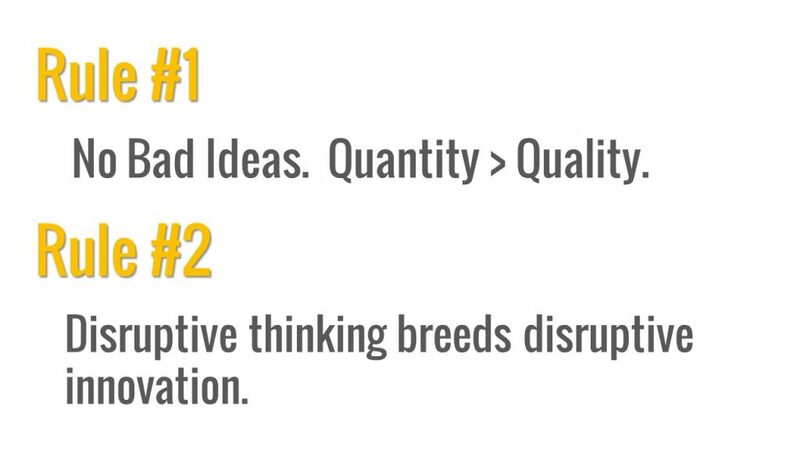 For Rule #1, remind them that brainstorming is most effective when they just focus on coming up with ideas…not coming up with good ideas. There will be plenty of time to winnow them down later so any idea that comes up, is a good idea. You want your students lighting the coloring book on fire, so they can melt the crayons into rainbow candles, and sell them at the farmer’s market. We want your students to develop solutions that eliminate the negative emotions customers feel, thereby solving a real problem. We consider a real problem to be one that causes customers to feel something uncomfortable. For example, receiving an F on a test is not a problem for a student. It becomes a problem when the student feels ashamed about repeating the class, or feels afraid of his parents’ reaction. Great solutions don’t just solve problems. They replace the uncomfortable emotion created by the problem. The question they write using the template above will serve as their motivation throughout their solution ideation process. They should return back to this question whenever they get stuck or need some inspiration. Your students should quickly list the first 5 solutions they can think of to answer the question from step 1. We want them to clear their mind of the easy solutions that anyone can think of and allow themselves to dig deeper into innovative thinking. Can they solve the problem with time travel? Next, have them write down three more realistic ideas that were not part of their thinking in Step 2. Now that they have let their mind go to the physically impossible, their subsequent set of realistic ideas should benefit having stretched their innovation neurons. Does kidnapping the smartest person in the world to help co-found this company help solve this problem help? If they blatantly copied an existing product, could that inform a better solution? If they stole a giant pile of money from a ruthless drug lord, how can that help solve this problem? As in Step 3, follow up the absurd solutions with having them then write down three more new realistic ideas. Now that they have let their mind go to the physically impossible and the illegal, their disruptive muscles will be much stronger. Encourage them to let the absurdity flow. Then do the opposite, they have to come up with two solutions to the problem that require no money at all – for them, or their customers. As before, after providing limitations on their ideas, lift the restrictions and ask them to use those as inspiration for three more realistic ideas. Each student/team will now have 20 realistic ideas of how they can solve their customer’s’ problem. If your students have conducted customer interviews prior to this exercise, which we highly recommend, they should write down the main deficiencies their customers are experiencing with their current solutions to their problems. If they haven’t conducted customer interviews, ask them to hypothesize two or three deficiencies with their customers’ current solutions to the problem. Ask your students to draw four solutions. This will engage a different part of their brain for their creative brainstorming than the one they’ve been using in the previous steps. Tell your students that the quality of their drawing is not relevant. What’s important is that they are expanding the way they think about solutions. Logical – which makes the most logical sense to them? Delightful – which would make their customers ecstatic? Inexpensive – which would be least expensive for them to build (thinking about both time and money)? Disruptive – which would be the biggest game changer for their industry/the world? In their drawings, they are not allowed to use words, numbers, letters, or characters. Only images. Drawing complements the writing they have been doing, to tap deeper into their creative potential. Each student should now choose two of the fours solutions they’ve drawn to test via experimentation. Once they’ve chosen their ideas, they should explain them to another student or team. Each exercise outlined above helps students feel safe exploring their creative potential and pushing past their comfort zone. They also provide your students with a large list of potential solutions. If you work with groups in your course, we encourage you to have your students complete the exercise individually, then aggregate their lists. Instead of 100 or 20 solution ideas, a group of four could potentially have 400 or 80 solutions to have fun exploring! Imagine your students able to quickly develop lists of creative, but impactful, solutions to problems they hear potential customers describe. We need to leave our comfort zone to create an engaging learning environment. For more details, take a look at the complete lesson plan we’ve provided below. We’ve created an experiential, 45-minute, Teaching Creative Solution Generation Lesson Plan to help your students generate more impactful solutions. It touches on everything we’ve talked about above. Use it as a basis to motivate your students to discover solutions beyond their comfort zone. It’s free for any/all entrepreneurship teachers. Please feel free to share it. All we ask is that you leave us some feedback on it the comments below so we can improve it! 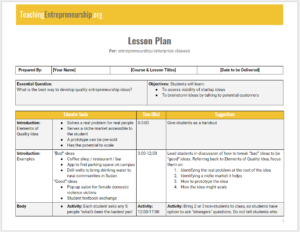 In an upcoming post, we talk about how to build a syllabus that engages students in a powerful conversation about their ideas, their fears, and their path toward entrepreneurship!